Starting to get settled in here with the initial shock of moving across country and into a completely different climate now fading away. I got a couple of paychecks under my belt too which helps in the confidence department. And I finally descended into the Canyon, bringing clarity and perspective to the big picture. I have always enjoyed hiking, whether it be the backcountry of Arizona or the concrete jungle of Manhattan. Hiking — which is walking essentially — can tell you a lot about yourself. 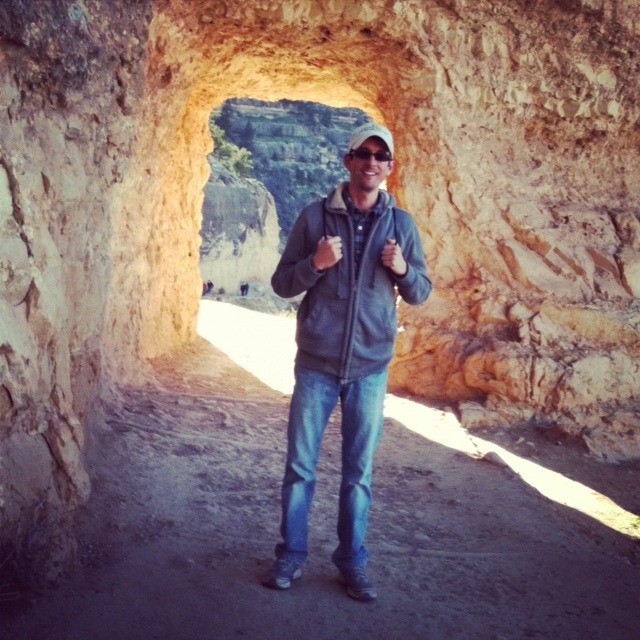 As I hiked down the Bright Angel Trail, my mind raced with thoughts dominated by fear. Had I brought enough water? Were my shoes appropriate?? Would I go too far down and not be able to make it back up??? All indeed valid questions. The Park Service does not supply the trail with water until the summer months, but it is in the spring — if the wind cooperates — when conditions are best to descend into the Canyon. The difference in temperature between the bottom, where the Colorado River flows, and the top of the South Rim is usually between 25-30 degrees. The deeper you go the hotter it gets. On this day the trail was full of hikers and tourists disguised as hikers. I have been surprised by the large numbers of foreign tourists that come here. I have engaged in more conversational French in one month than I had in 10 years in Panama City. This substantial presence of not only Europeans, but Asians has made me realize how foolish I was to believe that I was living in an international tourist destination in Panama City. That was a lie floated by the power brokers to build a new airport. Panama City may get a handful of international tourists, but it is far from an international tourist destination. It is a regional tourist destination at best and will remain that way until a better strategy of attracting visitors is implemented. Back on the trail, hikers had to make sure they not only avoided mule droppings, but also watched their step for loose gravel and leftover snow and ice. I wore my trusty adidas running shoes, the same pair I bought at the Ross discount store back in Panama City a couple years back. I have a habit about wearing shoes for a long time and this pair of adidas felt good on my feet. They may not look hiking professional, but they were light and comfortable and I was able to make my way down the trail without any missteps. There were a few tense moments like when the wind would gust up as I approached a narrow overlook with oncoming hikers headed my way. Fortunately, most of the people who hike are considerate and will always ask how you’re doing. I was relieved to make it to the first rest station, one and half miles down. Coming back was much tougher and required a couple stops to catch my breath and hydrate. What I learned about myself on this foray into the Canyon was I’m in better shape than I thought, but still have a ways to go to make it to the river. That is the goal during my time here — To hike to the bottom and back. It will take more than an afternoon to do it and I will have to be well prepared for the trip. And I probably shouldn’t go it alone.